You are here: Home / Michael J. Harrington, Sr.
People who say, “You can’t mix business and pleasure,” have never met Mike Harrington. His business is his pleasure. He opened Harrington Realty in 1979 and has 2 offices that offer commercial and residential clients a full menu of real estate and related services including insurance, title services, mortgage services, and property management.Mike’s journey into real estate began during his eleven-year tenure as manager of the Wise Discount Center in Downtown Dover. During the early 1970’s, he and his wife, Donna, started buying properties using owner financing. Soon after Mike and Donna opened Harrington Realty and in 1979, they purchased a local insurance agency. Today, Harrington Insurance has offices in Rehoboth, Seaford, Milford, and Dover. In the late 1970’s and early 1980’s, Mike was elected to the state legislature where he served as Chairman of the House Banking and Insurance Committees and served on the House Finance Committee. As Chairman of the House Banking Committee, he worked closely with Governor Pete DuPont and other Legislators to open Delaware to Interstate Banking. This effort has had a very positive and significant impact on Delaware’s economy. In addition to real estate and insurance, Mike’s property management company manages over 500 units in Kent County. A graduate of Goldey-Beacom business college, Mike was recently presented with the college’s highest honor of Distinguished Alumni and his picture was placed in the gallery at the college. A community service advocate, Mike works with many community and business leaders in a variety of organizations. 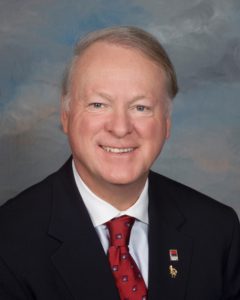 Mike has served two terms as President of the Central Delaware Chamber of Commerce. He was named Small Business Person of the Year for both the Central Delaware Chamber of Commerce and DECA. He currently serves on the Delaware Real Estate Commission and is a founding member of the Central Delaware Business Executives. He is an active member of the City of Dover’s Downtown Partnership, a group appointed by the Mayor of Dover to acquire distressed properties and make them productive properties in the City of Dover. Mike organizes and sponsors an annual charity golf event that has raised over $350,000 for Delaware Charities. He serves on numerous boards and service organizations and is an active member of local church organizations. A Delaware native, he and Donna have two sons, Michael Jr, and Justin and six grandchildren – Michael James III., Weston, Ava, Asher, Gia, and Tatym.